Holiday Inn & Suites Denver Airport welcomes party planners to explore all this full-service, airport hotel has to offer this holiday season. The hotel is offering discounted group room block pricing, where groups will receive one (1) complimentary room night for every thirty (30) room nights utilized in the block. 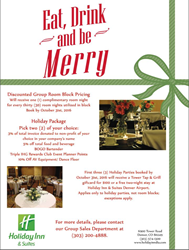 Along with great group pricing, the Holiday Inn & Suites is offering a Pick your Perk package for event planners. Event planners will be able to pick two of their choice regarding: 3% of total invoice donated to non-profit of your choice in your company’s name, 5% off total food and beverage, BOGO Bartender, Triple IHG Rewards Club® event planner points or 10% off AV equipment/ dance floor. The first three (3) holiday parties booked by October 31st, 2016 will receive a Tower Tap & Grill gift card for $100 or a free two-night stay at Holiday Inn & Suites Denver Airport. Exceptions apply and bookings must be made by October 31st, 2016. For more details, please contact the Group Sales Department at (303) 200-4888. Holiday Inn & Suites Denver Airport, a full-service hotel, is perfect for meetings, corporate stays and local events. Located just minutes from Denver International Airport, the hotel offers guests free high-speed Internet, fitness center, indoor pool, complimentary airport shuttle service and car rental service. Guests have their choice of king, two queens and various suite rooms. On-site restaurant, Tower Tap & Grill, offers guests great breakfast, lunch, dinner and happy hour offerings. With over 4,000 sq. ft. of flexible event space, the Holiday Inn & Suites Denver Airport is able to accommodate any type of event, from meetings to weddings and other social events. With plentiful catering options and experienced staff, your event will run smoothly. For more information and to make a reservation, please visit http://www.holidayinndia.com. Holiday Inn & Suites Denver Airport is proudly managed by Stonebridge Companies in Denver, Colo.